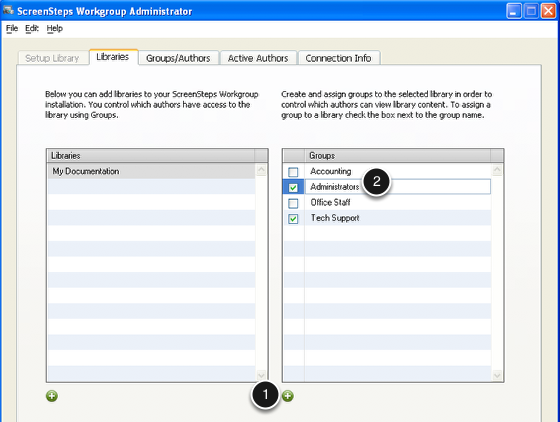 ScreenSteps Workgroup allows you to control who has access to a library by creating Groups and Authors. Each library can have one or more groups associated with it. Each group can have one or more authors associated with it. On the Libraries tab you can add and delete groups as well as associate them with Libraries. Click the + button to add a group. Double-click on a group to edit the name. You can delete a group by pressing the delete key while the group is selected. Note that you can also add and edit groups from the Groups/Authors tab. When you associate a group with a library it means that any authors associated with the group have access to the library. To associate a group with a library simply select the library (1) and check the box next to any groups you want to associate with the library (2). In this example the Administrators and Tech Support groups have access to the My Documentation library.